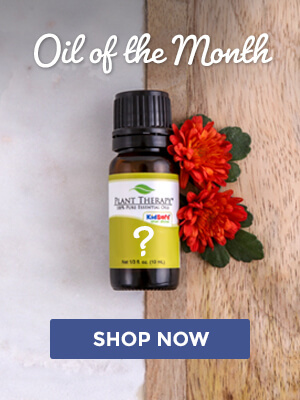 What Is a Carrier Oil and Why Do I Need One? I have a few recipes for 10ml rollerballs but I only have 5ml rollerballs, should I just use half of the recipe (ie. 2 drops of oil instead of 4 drops and 5ml of fractionated coconut oil instead of 10ml) or what should I do? Jess, cutting the recipe in half like you say will work just fine! And I want to link our dilution blog that is more current and a bit easier to understand than this one: https://blog.planttherapy.com/blog/2018/09/11/how-to-dilute-essential-oils-a-comprehensive-guide/ I hope this helps! This chart is exactly what I’ve been looking for. So helpful! Thanks! I have a couple of essential oil blends for my children. How do I make these into roller balls? Steph, if you have a 10 mL roller bottle, add 6 drops of your blend with the carrier to make a 2% dilution. I hope this helps! I have 10ml glass roll-on bottle. I want to do a blend. I have 100% pure essential oils. My top note is lemongrass, middle note is jasmine, and base note is sandalwood. And, my carrier oil is jojoba oil. I’m new at this. Conservatively, how many drops or % should I blend (jojoba, lemongrass, jasmine, and sandalwood)? George, a good place to start with a roll-on would be a 3% dilution. Now, because you have Lemongrass in the mix, you’ll need to be pretty careful. Lemongrass has a recommended dilution of 0.7%, which means you would need only one drop in a 10 mL roll-on to be safe. Altogether, with the Jasmine and Sandalwood, 9 total drops would make 3%. However, do you have our Jasmine (which has the botanical name Jasminum sambac), or do you have Jasmine from another company, which may not be the same species of Jasmine? I ask because our Jasminum sambac can be safely used up to 4%, but other species of Jasmine (such as Jasminum grandiflorum & Jasminum officinale) have dilution suggestions similar to Lemongrass. Feel free to respond back or reach out to our aromatherapists at [email protected] for more information or guidance on your blend! I have your Jasminum sambac. So to be clear, 1 drop of lemongrass, 9 drops of jasmin, 9 drops of sandalwood, and full the rest of the 10ml bottle with jojoba oil. Thank you! I’ll be getting these magnets if they are available. I love how helpful those at Plant Therapy are! Hi, what percentage of dilution will be okay for my hair? Ruth, I recommend starting with .5% and going up to a 1% dilution if needed. This is SO helpful!!! I just got a bunch of EO’s and will be diluting them this week so will use this a lot. Perfect!!! Thank you for sharing, Chloe! For example you want to make a 3% dilution blend of different essential oils in 1 bottle, do you put 9 drops of the different essential oils each or it has to be just 9 drops total regardless of how many kinds of essential oils thay you put in the blend? 9 total drops would give you a 3% dilution. Thank you for this chart. I have it on my refrigerator and use it often. I’m a little confused. I have a 10ml toll-on that’s I want to use for peppermint oil. One chart says for 2% dilution I should use 6 drops for 2 tsp. BUT the other chart says to use 6 drops for 10ml (which is much more than 2 tsp). So how many drops should be used for 10ml of carrier oil? Hi Anika, thank so much for reaching out! The good news is 10 mls of carrier oil is equal to roughly 2 tsps of carrier oil. A 2% dilution is 6 drops of essential oil to 10 mls (or two teaspoons) of carrier. I hope this helps! MRH states that a 2% dilution for 10ml is 4 drops, not 6. If 200 drops=10ml, then the math is correct. Do you know why the discrepancy? Thanks! Ali, Plant Therapy uses the dilution guidelines set by EO safety expert Robert Tisserand. I will link you to his official chart off of the Tisserand Institute if you are interested at looking at his recommendations: https://tisserandinstitute.org/wp-content/uploads/2016/05/EO-dilution-chart.pdf Also, we have an updated post that covers our dilution suggestions more clearly: https://blog.planttherapy.com/blog/2018/09/11/how-to-dilute-essential-oils-a-comprehensive-guide/ I hope this helps! I would bought Let It Be and would like to make it into a Roll On. What would the dulition rate be? We recommend a 2-3% dilution when using Let It Go topically. We hope you love this synergy as much as we do Lori! I bought your kid safe Germ Destroyer which says to dilute to 1-3% for topical application. So if I want to make a 10 ml roller bottle, at 2%, I would add 6 drops of the Germ Destroyer and then fill the rest of the roller bottle with carrier oil, correct? (I had initially pulled up several different dilution charts elsewhere that said 2% is 4 drops.) Also, I would like to use the Germ Destroyer on a regular basis over winter to ward off sickness, so is dilutiing to 2% a good choice for that? If I’m making a rollerball blend and diluting to 2% with a 10ml container, do I add the 2% dilution of the 3 scents I am adding or is it 2% total and I have to split up the three scents within that amount? Thanks! Hi Kimberly! It is the total of the 3 oils. I usually make up a master blend of the oils I want to use, and then dilute that to 2%. Where can I find the chart to dilute the kid’s safe oils ? I was taught 5 drops per 10/15ml and 2 drops per 5ml? Emma, 3 drops in a 10 ml is 1% and 5 drops would be approximately 1.75%. 5 drops in a 15 ml is just over 1%, and 2 drops in a 5 ml is !.5%. I hope this is helpful. 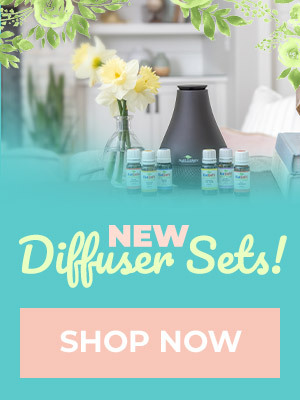 I’m new to essential oils and also confused with adding more than one oil. So my question is and sorry if it’s stupid , but the dilution amount is per (each oil if adding more than one oil) your adding to that amount?? ?OR the total amount of essential oils no matter how many different ones you want to add to carrier oil to equip that number for correct dilution???? Again sorry if it’s a stupid question I’m just extremely new to essential oils and don’t want to harm my little ones. Missy this is a very common question. It is the total number of drops no matter how many essential oils you are using. I like to make a master blend in a separate bottle and then use the number of drops necessary for the dilution percentage I want. Thank you so much very helpful. What do you mean by a Master Blend? How do I dilute a carrier oil with 2 or more essential oils? Does the total EO percentage have to add to the recommended percentage or can each EO have the recommended percentage? I bought your kit of 14 oils. Do they have to be diluted or are they use able as is? Hi Stephanie! If you purchased the undiluted set then they do need to be diluted. Dilution percentages range for each oil or blend,and you can find that information on the bottle or on our website. Is there a chart for diffusing with water? 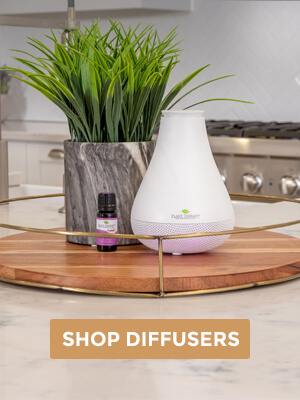 Diffusers vary so you would want to check the interest with recommendations for your particular diffuser. Do have a recipe for detox for the feet to soak in? If I am wanting to make a 10ml roller bottle with more than one oil at 4% of one oil and 10% of another will I add the EO #1 @ 4% of 12 drops and oil #2 at 10% of 30 drops and fill the remaining of the bottle with carrier oil? I am asking because I had a roller bottle I was making with 6 oils and the 6 oils was a considerable amount and only 2/3 of the bottle was left not allowing a full 10ml of carrier oil. Would it be better to just consider the conversion as a 5ml bottle and add 5ml of carrier oil on top? To simplify. If I add 10 oils to a recipe do I always add 10ml on top or 10ml total of carrier oil? It says the chart is unavailable? Can you please share the dilution chart? Thanks! what do you dilute the oils with? other oils? water? We tend to recommend beginning with a 2% dilution for most purposes. 5% would be used in the case of an acute injury or use only a few times. For longer term use – keep the dilution lower (about 2%). For use on the face, 1% is best. 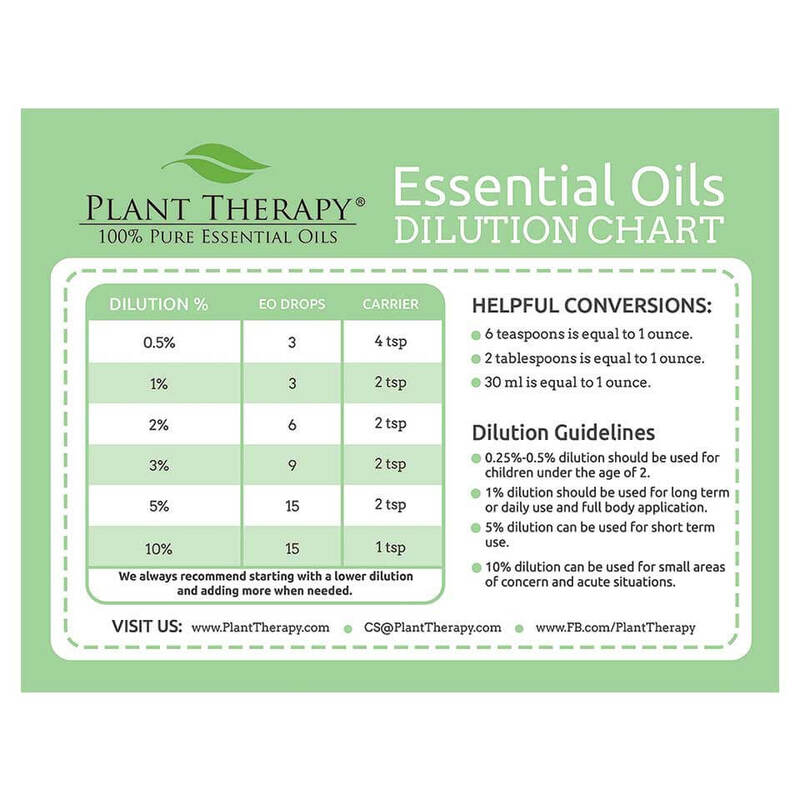 Do you use this dilution chart when you are making a spray? I want to make a bug spray with citronella and witch hazel for my one year old. I ordered the Sleep-Aid and it says to dilute to 3%. According to this chart I would add 27 drops to 2 tablespoons of carrier oil. Is that correct? It seems like that is a lot of oil to add to the carrier oil. 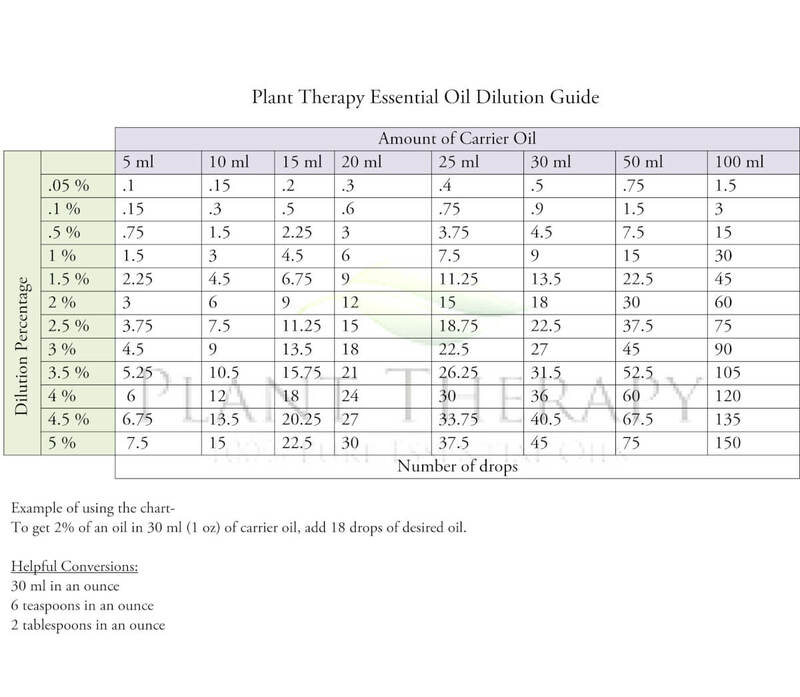 Might you have a chart of how much dilution is necessary for each oil? For example, considering buying cypress but don’t know how much it needs to be diluted. But it doesn’t appear to be under that one. I could be looking in the wrong place. . .
Is it ok to use virgin coconut oil to dilute (instead of the fractionated kind)? I’m asking since I already have that at home and wondering if I can avoid buying something additional. Thanks! Do you have anything for dogs? I have a dog who is 8 years old and has chronic yeast infections that are getting worse and closer together. Nothing seems to help. We have no education on essential oils an animals. I suggest a good book written by Kristen Leigh Bell called Holistic Aromatherapy For Animals. After mixing “larger” batch of EO and carrier oil, how should I store it for future uses? Can the mixture be used (and come through) the spray bottles PT sells? Or should I get the glass jars? Thinking mostly of the Silky Soft blend for my 5yo daughter. Mixed with grapeseed oil last night and used for the first time. Thinking it would be easier to make a larger amount and have ready to go after her shower. Thanks!! Once combined with a carrier, storing in a glass bottle is the best way. Keeping a cool, dark place when not in use & it will last as long as the carrier it is mixed into. It seems to me that this chart is flawed. If there are 20 drops in a ml (as I’ve always known) and I want to make a 1% dilution, I should add 2 drops EO to 10 ml (or 200 drops) carrier oil, NOT 3 drops. Three drops would make a 3% dilution, wouldn’t it? This chart comes directly from Robert Tisserand’s book, Essential Oil Safety. Drops can range anywhere from 20-40 drops in a ml depending on the size of the drop so for this chart, Mr. Tisserand took the average based it on 30 drops in a ml. What % of dilution would you use in a rollerball with with your headache relief synergy oil blend? I started with 2%, should I increase? What % dilution would you use for an adult with your headache relief synergy oil blend? I use my oils straight from the bottles and usually difuse I drop oil 1 drop carrier. Is there a chart for that? For 1 drop at the time? Not mls. Proper dilution is always a must! You can find our dilution guidelines by typing “dilution chart” into the search box on the home page of the blog! Thanks!! I recommend starting with a 1% dilution for your 3 year old and starting with a 2% dilution with your 11 year old. When I try to click – or even copy & paste that chart link, it just gives me weird errors…? I’m sorry to hear that! If you would like feel free to email us at [email protected] and we would love to send them to you as an attachment. Looking forward to hearing from you! You could do 20-40 drops. That would be between a .5% dilution and 1.% dilution. what dilution do you usually use in your roll on containers. 1-10% depending on the oil. How do you measure a .1 (tenth) of a drop of oil for 5 ml? You can’t. You would just need to increase the amount of carrier you use. There are a lot of people who recommend that a young baby only use essential oils at a dilution of 0.2% max. This chart will show you that you will need to make a large batch to get that dilution.